Vocabulary.com is one terrific website for all-things word related. One of its best uses is for the creation of vocabulary lists that can be individualized for each lesson and for each student. Along with definitions and example sentences, Vocabulary.com uses "Word Blurbs" to demonstrate in a humorous and memorable way, the meaning of the word. These blurbs along with the many, varied ways words are presented on the site are sure to make word meanings and usage stick with your students. Designed for use by core and non-core teachers alike, I've created print-and-use instructions that guide students through 1. 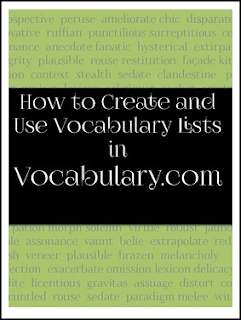 How to Create Vocabulary Lists on Vocabulary.com and 2. How to Study Vocabulary Words using the lists that they have created. You can distribute these instructions to your students and they can begin creating vocabulary lists on Vocabulary.com today! If you find these instructions helpful, please give them a positive rating. If you'd like to be the first to hear about more Secondary ELA resources that will save you time, make your teaching more efficient, and make and your job more enjoyable, click the green star to follow me!